Provide comfort for the family of Katherine Radecki with a meaningful gesture of sympathy. 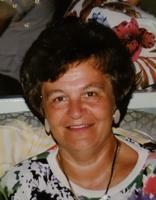 Katherine W. Radecki (nee Weber), age 85, of Burlington, NJ passed away while surrounded by her loving family on Sunday, March 24, 2019. Mrs. Radecki was born and raised in Buffalo, NY before moving to South Jersey 45 years ago. Katherine was President of both the PTA at Corpus Christi Church and the Columbiettes out of Willingboro, NJ. Above all else, she cherished being a mother, grandmother and great grandmother, and she will be deeply missed by those she leaves behind. Katherine is survived by her beloved spouse, Joseph J. Radecki, Sr.; children, Joseph J. Radecki, Jr. (Debbie), Katherine O’Hara (Joe), Bonita Reynolds (Tim), Lynn Sluka (Joe); 14 grandchildren; and 4 great-grandchildren. A viewing will be held on Friday, March 29th from 9:30 to 10:30 AM immediately followed by the funeral mass, both at Corpus Christi Catholic Church, 11 South Sunset Road, Willingboro, NJ 08046. Final disposition will be private.